The moment all you LOST fan artists have been waiting for. 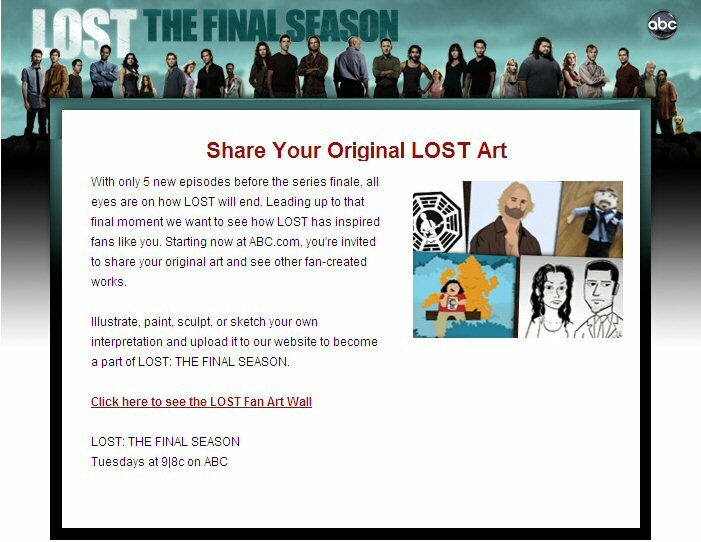 ABC have invited you all to upload your own artistic submissions to the ABC website Click here to go to the Fan Art part of the ABC website. 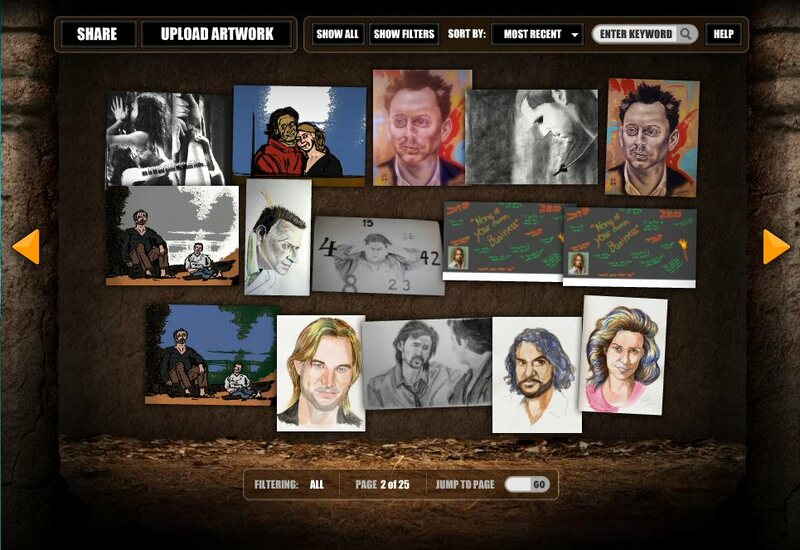 I was checking out the LOST Fan Art wall a few weeks ago. Looked great. very neat stuff on the fan wall. Some absolutely beautiful work and some not so beautiful lol but all fun. Great to get a post here, really made my day ! Andrew's Faraday was on page 2. I really would rather not get rid of these, (mostly because I slept overnight on the street to get them... They are a reward of fandom, and it's painful to let them go..) But here's the deal: I'm buying a house. I REALLY need the extra cash... Buying a house in LA isn't cheap and any extra bit of cash helps. I'm also selling some of my prints (even more painfully/regrettably...)and possibly a Taweret statue... I wanted to come here before I hit the 'bay, so the hard-cores can take a gander at it first... Anyway, please check out my post on the "Trades & Sales" forum on DarkUFO for details. Sorry for "bombing" the post here a bit, but I figured I'd throw this out there, and I know some of you guys, so maybe you'll go a bit easy on the angry mob/pitchforks! Thanks! I don't think this is "spam-ish" at all, and for one, am grateful! But, I was hoping that perhaps you can post a link? I'm digging through the forums on DarkUFO and am having trouble finding it. Thanks! The new Lost merch on the abc store is pretty cool. Some Mr. Clucks posters and tshirts. I put my Lost Quilt on the ABC Lost Fan Art Wall. Currently it's on page 13. Fiiiinally! This artwork fanpage is all i've ever wanted!! :D I mentioned this idea during the summer art thing and got banished from the camp. PS: What do u think of my "Smokey vs. Polar Bear" and my "Man of Faith" ...? LOST animated promo by Hexagonall. I just got the latest issue of Wired Magazine in the mail today... and there is a great article about LOST in it. The coolest part of the whole article? There is a picture of Damon and Carlton in the Writers Room... in front of a huge whiteboard... but instead of being their normal secretive selves, there is all SORTS of stuff written there! Nothing spoilerific as far as I could see (there are episode names of two recently aired shows)... but a fascinating glimpse of the process they used to plot out the story of our favorite show! Definitely worth taking a look at if you can get your hands on it! Looking forward to seeing some of my LOSTargs friends in LA again... and hopefully meeting a few of you for the first time! There is a search feature now for the wall-works well. Maven- your quilt is great-maybe I will see it in person at the LA finale shindigs? Matt-really striking - are your works computer created images? Very unique. Pat- what are you attending in LA? Going to the Jack and Jay party by any chance? wow Chris, glad you made it back safe and sound ! It must be pretty scary to see all that ash (if it could be seen where you were) Glad your back, you didn't miss much except being missed. Hey Chris- glad you got back. I have relatives trying to get back to the States who are delayed also. Not something you normally would imagine disrupting your plans! I was wondering- if you have seen the new Dr Who- in the UK airing do they say Prisoner Zero? I wondered if it might not be Prisoner Zed over there. hey soo.. what's happening with the "LA finale shindigs" that u mentioned? Is there some kinda event that's gonna take place? Nope, it was Prisoner Zero over here. Was a good episode, wasn't it? Welcome Back!!! Oh and in regard to the thing I said I would send you in the postcard, totally forgot so will try and send it this week. This whole ash thing i'm happy didn't happen a month ago. I have one friend who was supposed to be in Rome on Wednesday and another friend who is in LA waiting for a flight home to Sweden. Of course, I feel more sorry for the Rome guy as he has to wait in England whereas my LA friend is sitting on Venice Beach until the ash clears. Thanks guys... I had a ball actually... particularly Berlin. Amazing place. Looks as though I missed a Tee Fury shirt. Anyone have a pic of it or link? Or indeed, a spare? And I still have not seen last weeks ep! Seeing it tonight... delayed gratification! My Olly Master Race was waiting for me on my return as was the outstanding Deer Hunter from my even more outstanding San Diego LOST pal! Great stuff to arrive home to. 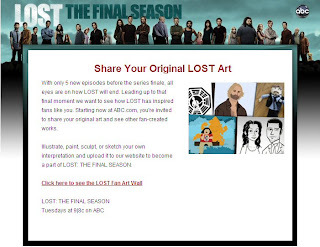 The finalists in the abc LOST Fan Promo Contest have been selected. Voting ends Friday, April 23. Glad you got hooked up with a Deer Hunter! That's the one you really wanted right? I sucked it up and ended up buying a Last Crusade off ebay. Some of those are pretty cool. I'm excited to see which one wins. @Matt-a few things in LA- on May 13th- I think it's called the Lost Celeb night- Michael Giacchino is directing Lost music, the next to last epp is pre showing & cast members going. Carlton was tweeting info about it. There is also a live interview show in NY with Darlton that is being shown in movie theaters across the country on May 2oth- some people are meeting in LA to go there I think. Then- the one I have tickets for is the Jay & Jack party and showing at the Orpheum Theater in LA on finale night- the 23rd. Hearing twitter rumors that ME might be there. The night before there are plans for a dinner-Lotto has been getting people together for that- most are going to the Jay & Jack party next night. Wish I could go to everything! Martyn- yes of course it was Zero(palm to head) Zed is Z as my son (whose name starts with Z!) pointed out to me. They can't do much to Who that I don't like- it's all fun. I kind of wish they'd stop with the "I am brilliant so be very afraid " stuff though. Show- don't tell! Man. These LOST Fan Promos are so much better than I expected. These five are so good though the best ones have to be "The Lost Life" and "The Obsession", followed closely by "Convergence". Were they given a specific set of rules for the promos? They all seem so similar. I think they were only allowed to use the Lost music/videos/sounds that were given on the website. If they wanted to add anything other than that, it had to be their own work. @Ray, yep... it was The Deer Hunter that I REALLY wanted... very happy. Loving those promos... Convergence and The Obsession for me. Hey everyone! Sorry for the "radio silence" the last few days... I just had a busy week at work, followed by a busy weekend. Whew! Happy LOST Day, everyone! We're in the home stretch...! Oh, crap, there are lots of spoilers in that picture. DOES NOT WANT! Damn you people are fast to read! Yeah the picture looked like it was totally spoilery. I picked up wired on my train back to CT from the city this weekend. But yeah, it looks like they photoshopped a bunch out, but there are still some things left on the board that made me turn the page immediately! @Patmc, I thought about the idea of red herrings, but the titles of tonight's epi and 6x16 are definitely correct. Happy LOST day everyone (in the US anyway). Watched it last night Pat... desperate for a re-watch but that will have to be tomorrow when we'll do 2 eps back to back! I loved this weeks though. So many more questions!!! I mean last weeks... I don't know where I am!! Some nice stuff hidden in that picture. Looks like the bag of ash is by Damon. Thanks Amy Lynn for scouting the Wired stuff. So to compromise, I bought the magazine- but won't look at it till later- I guess much later if the epp 16 title is there. Looking forward to last nights ep as soon as I get home tonight. Hope you all enjoyed. Happy B-Day Ellen! Hope you have a fantastic day! Haven't posted here in a while...fells a bit weird. ChrisL -- glad your home safe and sound and that the Volcano Smokay didn't further hamper any plans. Cheers OB, good to see you! Anyone planning on going May 13 ?